To understand the concept of armature reaction in DC generator, please go through the previous articles describing the construction of a DC generator. The concept of armature reaction is well explained in this article. The purpose of field winding is to produce a magnetic field (called main flux) whereas the purpose of armature winding is to carry armature current. Although the armature winding is not provided for the purpose of producing a magnetic field, still the current in the armature winding also produces a magnetic flux (called armature flux). The armature flux distorts and weakens the main flux and create problems for the proper operation of the dc machines. The action of armature flux on the main flux is called armature reaction in a dc generator. The phenomenon of armature reaction in a dc generator is shown in the figure below. For the sake of clarity, we are taking only one pole. When the generator is on no-load (Figure i), a small current is flowing through the armature and therefore flux produced in the armature is very small and it does not affect the main flux φ1 coming from the pole. When the generator is loaded (Figure ii), high current start flowing through the armature conductors, thus a high flux φ2 is set up as shown in fig (ii). By superimposing the fluxes φ1 and φ2 (Figure iii), we obtain the resulting flux φ3 as shown in fig (iii). This is what happens to the flux under one pole under armature reaction in a dc generator. From fig (iii) it is clear that flux density at the trailing pole tip (point B) is increased while at the leading pole tip (point A) it is decreased. The main flux is distorted. The main Flux is weakened. The weakening of flux due to armature reaction in a dc generator also depends on the position of the brushes. For that, we need to understand the geometrical and magnetic neutral axes. The geometrical neutral axis and magnetic neutral axis should be clearly understood in order to get a clear idea of armature reaction in a dc generator. The geometrical neutral axis (GNA) is the axis that bisects the angle between the center line of adjacent poles. The magnetic neutral axis (MNA) is the axis drawn perpendicular to the mean direction of the flux passing through the center of the armature. No e.m.f. is produced in the armature conductors along this axis because then they cut no flux. When no current is there in the armature conductors, the MNA coincides with GNA. Consider no current in armature conductors, then MNA coincides with GNA. Now, when current start flowing through the armature conductors, due to the combined action of main flux and armature flux the MNA get shifted from GNA. In case of a generator, the M.N.A. is shifted in the direction of rotation of the machine. In order to achieve sparkless commutation, the brushes should be moved along the new MNA. It demagnetizes or weakens the main flux. It cross-magnetizes or distorts the main flux. Let us discuss these effects of armature reaction in a dc generator by considering a 2-pole generator (though the following remarks also hold good for a multipolar generator). Fig (i) shows the flux due to main poles (main flux) when the armature conductors carry no current. The flux across the air gap is uniform. The m.m.f. producing the main flux is represented in magnitude and direction by the vector OFm in fig (i). Note that OFm is perpendicular to GNA. Fig (ii) shows the flux due to the current flowing in armature conductors of dc generator alone (main poles unexcited). The armature conductors to the left of GNA. carry current “in” (×) and those to the right carry current “out” (•). The direction of magnetic lines of force can be found by corkscrew rule. It is clear that armature flux is directed downward parallel to the brush axis. The m.m.f. producing the armature flux is represented in magnitude and direction by the vector OFA in fig (ii). Fig (iii) shows the flux due to the main poles and that due to the current in armature conductors acting together. The resultant m.m.f. OF is the vector sum of OFm and OFA as shown in fig (iii). Since MNA is always perpendicular to the resultant m.m.f., the MNA is shifted through an angle θ. 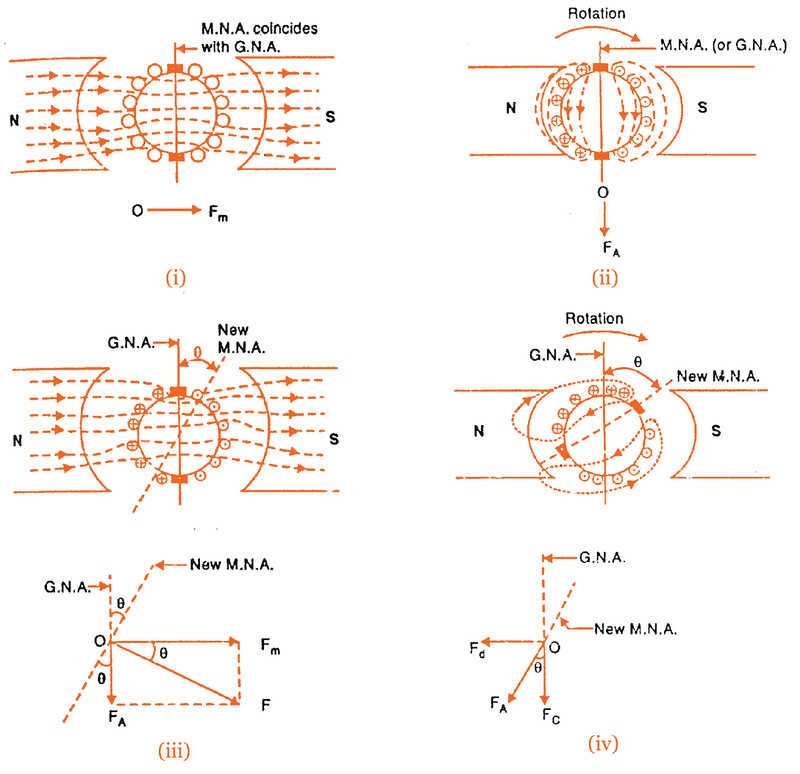 Note that MNA is shifted in the direction of rotation of the generator. In order to achieve sparkless commutation, the brushes must lie along the MNA. Consequently, the brushes are shifted through an angle θ so as to lie along the new MNA as shown in Fig (iv). Due to the brush shift, the m.m.f. FA of the armature is also rotated through the same angle θ. It is because some of the conductors which were earlier under N-pole now come under S-pole and vice-versa. The result is that armature m.m.f. FA will no longer be vertically downward but will be rotated in the direction of rotation through an angle θ as shown in Fig (iv). Now FA can be resolved into rectangular components Fc and Fd. The component Fd is in direct opposition to the m.m.f. OFm due to main poles. It has a demagnetizing effect on the flux due to main poles. For this reason, it is called the demagnetizing or weakening component of armature reaction in dc machines. The component Fc is at right angles to the m.m.f. OFm due to main poles. It distorts the main field. For this reason, it is called the cross magnetizing or distorting component of armature reaction in dc machines. It may be noted that with the increase of armature current, both demagnetizing and distorting effects will increase.